Ranching companies are intent on clearing the last forest refuge of the uncontacted Ayoreo. A new scientific study has revealed that Paraguay’s Chaco forest – the last refuge of the uncontacted Ayoreo tribe – is being devastated by the world’s highest rate of deforestation. These dramatic satellite images show the astonishing extent of forest destruction in the Chaco between 1990 and 2013 – and also that the area claimed by the Ayoreo (red outline) is one of the last remaining patches of forest left. Like many indigenous peoples around the world, the Indians depend on the forest for their survival and have protected it over thousands of years. Paraguay’s Environment Ministry recently caused outrage by granting Brazil-owned ranching companies Yaguarete Pora S.A. and Carlos Casado S.A. (a subsidiary of Spanish construction company Grupo San José) licenses to clear the Ayoreo’s forest, despite it being within a UNESCO biosphere reserve. The uncontacted Ayoreo are forced to live on the run from the bulldozers constantly clearing their forest. Any contact with the ranchers could kill them as they lack immunity to diseases brought in by outsiders. 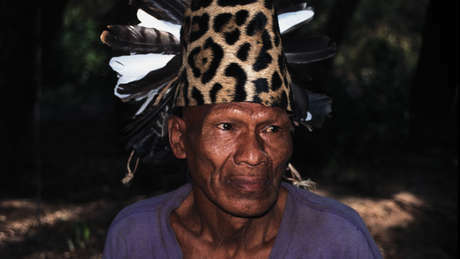 In an urgent appeal to the UN’s Special Rapporteur for indigenous peoples, the Ayoreo organization OPIT said, ’(For the Ayoreo and their uncontacted relatives), protecting the forest and their territories constitutes life itself. *The study was conducted by M.C Hansen et al (2013), and is titled, ‘High-Resolution Global Maps of 21st-Century Forest Cover Change’. It analysed satellite data from 2000 to 2012 and demonstrates that Paraguay had the highest net loss/area for that time period.